Unjust: How the Broken Criminal Justice System Fails LGBT People documents how pervasive stigma and discrimination, biased enforcement of laws, and discriminatory policing strategies mean that LGBT people are disproportionately likely to interact with law enforcement and to have their lives criminalized. LGBT people are also treated unfairly once they enter the system; the report shows how they are overrepresented in jails and prisons and face abuse while incarcerated. Finally, the report sheds light on the fact that LGBT people face unique and considerable challenges in the struggle to rebuild their lives after experiences with law enforcement—and particularly after time spent in a correctional facility. 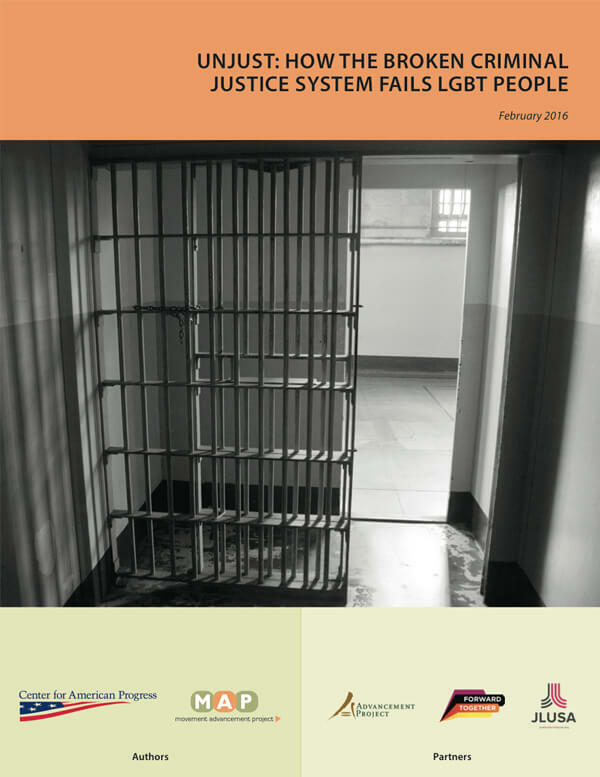 To illustrate the real impact of these failures in the criminal justice system, the report highlights personal stories of LGBT people impacted by the criminal justice system and spotlights innovative programs, initiatives, and organizations from around the country. Movement Advancement Project and Center for American Progress. February 2016. Unjust: How the Broken Criminal Justice System Fails LGBT People. http://www.lgbtmap.org/lgbt-criminal-justice (date of access).